East Germany, 1983, 102 minutes, Colour. Sylvester Groth, Fred Durer, Matthias Gunther. 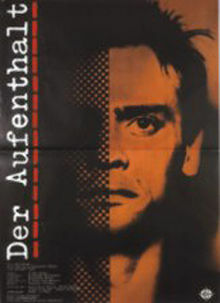 Der Aufenthalt (The Turning Point) is an excellent East German film. It is a true story, based on Hermann Kant's own experience when he was drafted into the German army towards the end of World War Two at the age of 19. The film shows a bewildered young man, accused wrongly, imprisoned by the Army, ridiculed, with pressure on him by fellow soldiers. The setting is Poland and highlights the animosity between Poland and Germany. The young man discovers the horrors of war as well as the concentration camps. The acting is excellent, the pace and atmosphere very strong - one of the best portraits of a man in a prison situation. 1. The impact of the film? Emotional response? Intellectual response? Moral response? 2. An East German production? Colour photography, acting, editing? Authentic atmosphere? 3. The atmosphere of the '40s, an East German look back at World War Two and re-assessing it? The Polish point of view? The war, prisons? 4. The title and the focus on Mark Niebuhr? Following through his harrowing experience? Of the experience as a turning point in his life? Where he had arrived at at the end of the film? 5. The opening with the accusation, his experience, taken, registered, stripped, the cell? The audience not knowing the truth as well as Mark not knowing? 6. The audience sharing Mark's point of view - the unknown, what was on the outside, the puzzle of imprisonment? 7. The film as a picture of prison life and suffering: the cell, his standing, writing, the details of the daily life, standing to attention? The Polish attitude towards German prisoners? Food, being watched? The interrogations? Cell and the vegetable? His being with others - the S.S.? Work, the heights, food, the fall, arm in plaster? The girls - and Mark as a youngster? The Germans and their style, suspicion, treatment, friend and foe? Eric disowning? Comrades, drowning? Staying awake? The cumulative effect of this visualising of the prison experience? 8. The experience of an innocent sufferer? The impact of this kind of suffering on the audience - the feeling of helplessness, fear, dread? The realities of coping and trust? 9. The Polish experience of the war, Warsaw, Lublin, officers, interrogation, the warder and the fish, the heights, doctor and no word - no apology? The nature of justice? 10. The Germans in the group, the crimes, coping, rationalising, discipline, surviving, hostile, the hangings and executions? 11. The film as a view of war, a memorial of the war experience? 12. The issues of the human person: Mark as an ordinary citizen, the effect on his life? The importance of human dignity?